The Green River, the most significant tributary of the Colorado River, runs 730 miles from the glaciers of Wyoming to the desert canyons of Utah. Over its course it meanders through ranches, cities, national parks, endangered fish habitats, and some of the most significant natural gas fields in the country, as it provides water for 33 million people. Stopped up by dams, slaked off by irrigation, and dried up by cities, the Green is crucial, overused, and at risk, now more than ever. Fights over the river’s water, and what’s going to happen to it in the future, are longstanding, intractable, and only getting worse as the West gets hotter and drier and more people depend on the river with each passing year. As a former raft guide and an environmental reporter, Heather Hansman knew these fights were happening, but she felt driven to see them from a different perspective—from the river itself. So she set out on a journey, in a one-person inflatable pack raft, to paddle the river from source to confluence and see what the experience might teach her. Mixing lyrical accounts of quiet paddling through breathtaking beauty with nights spent camping solo and lively discussions with farmers, city officials, and other people met along the way, Downriver is the story of that journey, a foray into the present—and future—of water in the West. Heather Hansman is an award-winning journalist whose work has appeared in Outside, California Sunday, Smithsonian, and many others. After a decade of raft guiding across the United States, she lives in Seattle. "In an energizing mix of travelogue and investigative journalism, Hansman, a raft guide and environmental reporter, provides a straightforward elucidation of the mind-bogglingly complicated subject of water rights in the American West. . . . Travel enthusiasts will appreciate Hansman’s descriptions of her rafting exploits, love of wildlife, and admiration for the power of water, while policy advocates will mull over her thought-provoking insight into the West’s water conundrum." "Hansman delivers a worthy updating of a core library containing such works as Marc Reisner's Cadillac Desert and Philip Fradkin's A River No More. An insightful look into the unsustainability of western waterways." "Whether you're a westerner or not, you'll be caught up in the hustle and flow of this universal story, one that has rippling effects on our entire country." "[Downriver] is a blend of personal narrative, water policy research and on-the-ground reporting in the rural West. It’s about her growing comfort with solitude, the technicalities that define a water right, and the people she met along the way. But it’s also a testament to how recreation can serve as a door to learning and an opportunity to engage with big issues that paddlers—and all outdoorspeople, including climbers, skiers, hikers, surfers—tend to be passionate about." 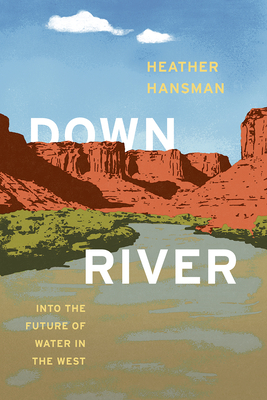 "Hansman is willing to interrogate her own assumptions, to speak to people with differing views, and to allow western water issues to become more complicated, not less, as she moves down the river. She explores the sticky parts of western water policy, just as she explore the less-loved sections of the Green."